Athinas is a main street in downtown Athens, named after Athena, the goddess of wisdom, and protector of the city of Athens. 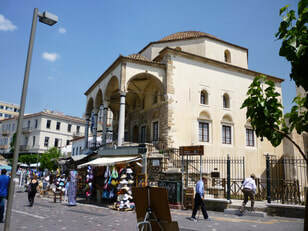 It takes in Varvakeios (Municipal) Central Market, a rectangular building with a large covered court, including the Central Meat and the Fish Market. There are a total of 73 food stalls in both the interior and exterior sections. The market is covered with a glass and metal roof and has symmetrical windows. 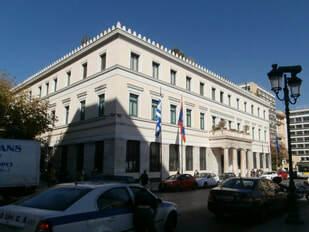 It is open every day but Sunday, from early in the morning till late afternoon. Several restaurant owners come here every day to to shop rather than going to the Market of Rendi, the Wholesale Market which is at a distance from the center of Athens. Many Athenians shop here for both freshness, variety of selection and considerably lower prices than in the local neighborhood stores. The Public Market Place of Athens has been in business since 1886. This area, including Evripidou and Sophocleous streets is where you can buy fish and meat, but also produce, fresh vegetables and fruit from all over Greece, or sample cheese from the Greek islands. ​On Evripidou street you may also find the delicacy called “pastourma”, a variation of pastrami. It is dehydrated goat, beef, lamb or, and the best, camel meat, covered with a cumin paste called tsemeni, prepared with distinctive herbs, garlic, and hot paprika which gives it its distinctive taste. There are two shops renowned for their cold cuts, namely Miran and Arapian. 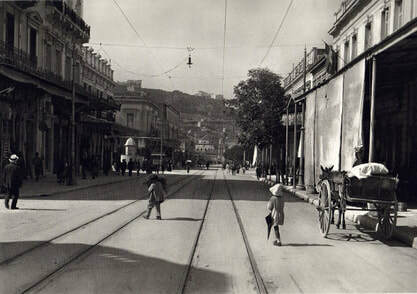 A 1920 photograph of Athinas Street, the Acropolis in the background. Athinas Street herbs, spices and teas vendor. Also on Evripidou Street among the several stores, are the cheese shops Bitsika, Arcadia and Zafolias, known for their expansive selection of the finest local cheese varieties from all over the country. Evripidou Street is also famous for herbs and spices, seasonings, nuts and dried fruit! We strongly recommend that you visit Bahar or Elixir! You will encounter wonderful stuff you never even knew they existed! Along Athinas Street the shopper may also buy teas of all sorts, a pair of shoes or sunglasses from a street vendor, a pair of jeans or a Panama-style hat, work clothes or excursion gear, tools for all trades, gadgets, novelties and all sort of merchandise from the numerous stores and street vendors willing to sell anything but their mother! Koudounia, offering all kinds of traditional Greek hand-made bells for animals and all sorts of accessories. 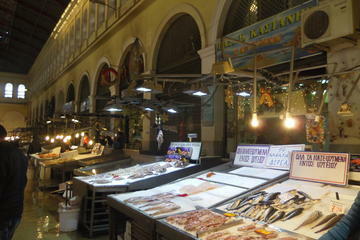 No trip to Athens is complete without some time spent exploring Varvakios; the Athens central food market. Join us at The Greek Kitchen, we know the area inside and out, it's where we're based after all. Omonia might have a less than perfect reputation but it's actually a vibrant, historical area packed with amazing places to shop, eat and drink. We want to show you this side of the neighborhood along with food tastings, shots of local liquor and a tasty lunch back at The Greek Kitchen cooking studio. Dozens of stores with tools for all trades and clothing for all purposes. 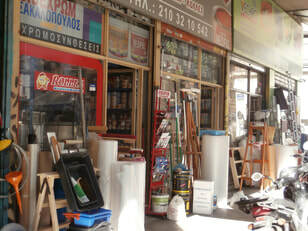 On 32, Athinas St. check out the Spyros Syllas store with utensils of all sorts carved in wood. 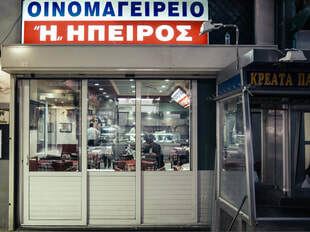 In the area around the Central Market you will also find small restaurants with fresh -from the market- food, attracting Athenians especially after midnight. 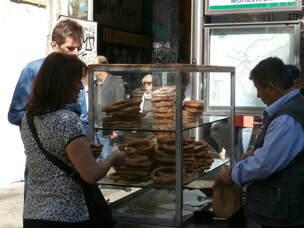 Try the traditional Greek koulouri from a street vendor. There is a small grove on the Varvakeios Square across the street which is now landscaped, with several cafes, and offers an opportunity to take a break from the frenzy of the market. This culinary tour is unique! 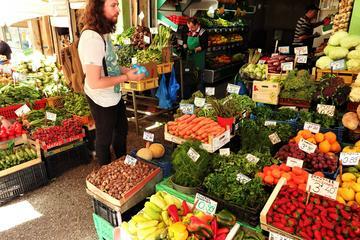 You will visit the Central Market of Athens in the heart of the commercial center of the city, the Central Meat and Fish Markets, you will learn stories and myths of Athens and you will end up cooking and eating together in a open-air community kitchen. Everything started with the craving and passion of Miran Kourounlian, from Caesarea in Cappadocia, the founder the business. He started in 1915 in Constantinople and from there to the island of Chios, and then to Palea Kokkinia. Today, the retail can be found on 45 Evripidou St., off Athinas Street, selling pastourma (seasoned beef/camel meat), soujouk (seasoned beef meat in sausage form) and all sorts of meat and cheese varieties. Visit them at the store or at www.miran.gr.